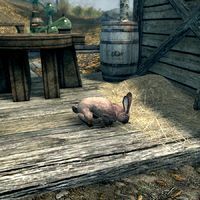 Thistle is a trained rabbit found at the abandoned Alchemist's Shack in the mountain pass south of Ivarstead. You can feed it carrots to make it your pet. Unlike normal rabbits, it is a soft beige color. It can be equipped with an Animal Collar but cannot wear an Animal Pack. It is essential and will not engage in combat. Thistle can be summoned using a teleportation spell. It can be instructed to follow you even if you already have another pet following you. You can instruct it to wait at a city, wait at its current location (either temporarily or permanently), wait at your house, or to carry items. It can also be instructed to "go find an ingredient", which will cause Thistle to run to the nearest harvestable ingredient plant. If there are no plants nearby, you will receive a message stating that Thistle couldn't find anything. The Notes on Tamed Rabbit contains background information on Thistle. This page was last modified on 1 September 2018, at 16:26.